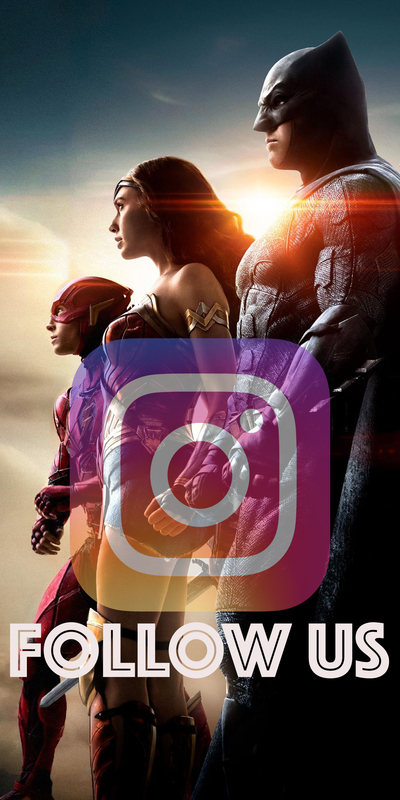 Aquaman and Mera are off on a couples adventure as the continue chasing down the whereabouts of Arthur’s long lost mother. Through seas and magic portals, the two now face a very strange world with an unfamiliar face to welcome them. Jeff Parker starts to get a bit of bite back to the story as he moves the Atlantian couple out on their own to finish the quest at hand. I liked that this issue had a good balance between story and both imagery as Parker used his speech bubbles wisely. 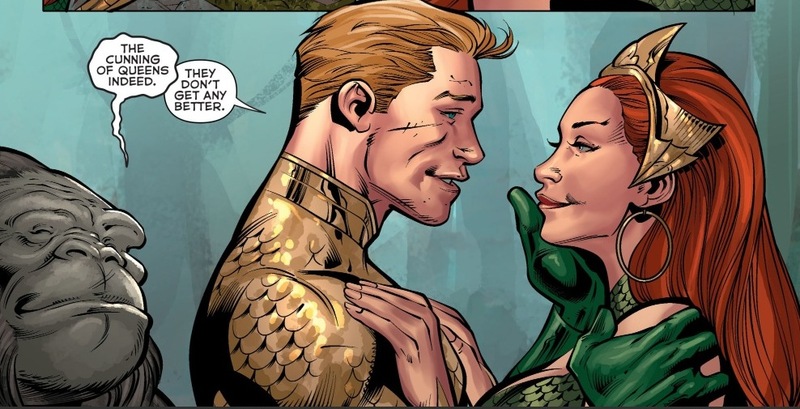 Usually cluttered with text, this time they seemed a bit more spaced out and shorter with sassy comments streaming from Mera’s lips proving she can hold her own with the more subtle Aquaman. I found that the issue flowed nicely and seemed to pick up a bit of pace though the cliff-hanger at the end as just cruel to someone who has already seen the epic artwork to come. 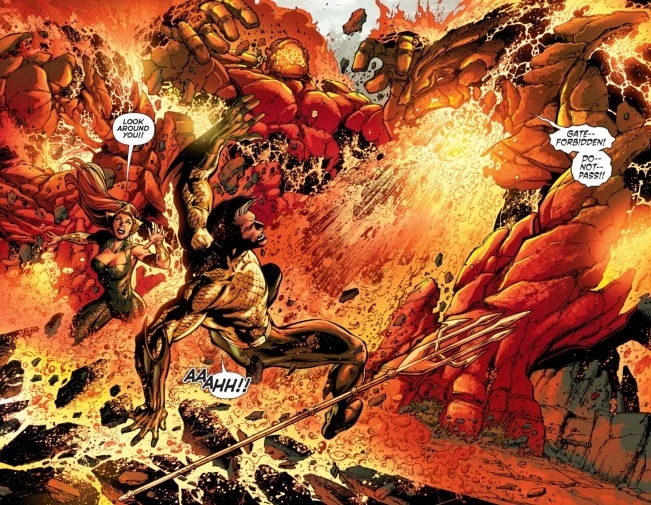 Paul Pelletier and Rain Beredo have given no halt to the glorious splash page panels and wild color contrasts that explode off the issues pages. 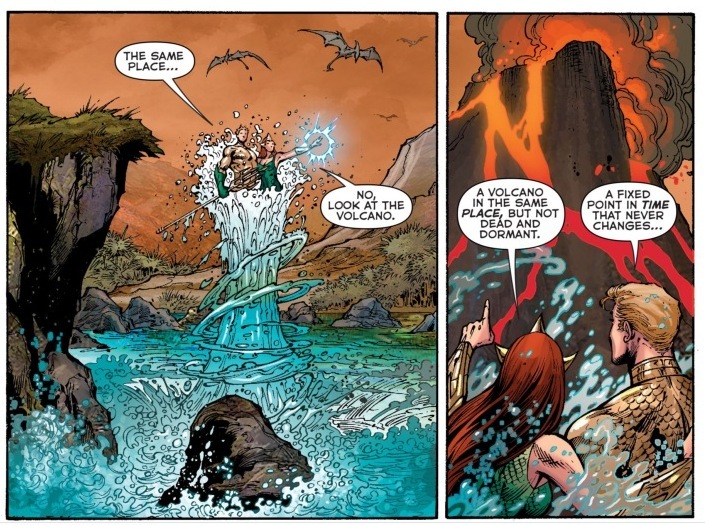 I love that anything Atlantian retains its glimmer and sheen resounding the theme of water at every turn and driving the motif that he is King of the seas into the reader’s minds. I was also happy to see that each of the characters drawn had a very beautiful, soft quality to them. 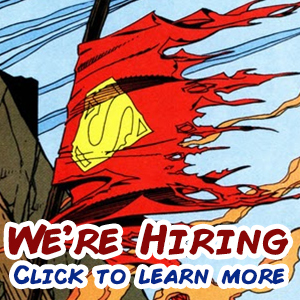 They prove that not everything needs to be harsh lines like Superman or gritty and gruff like Batman. 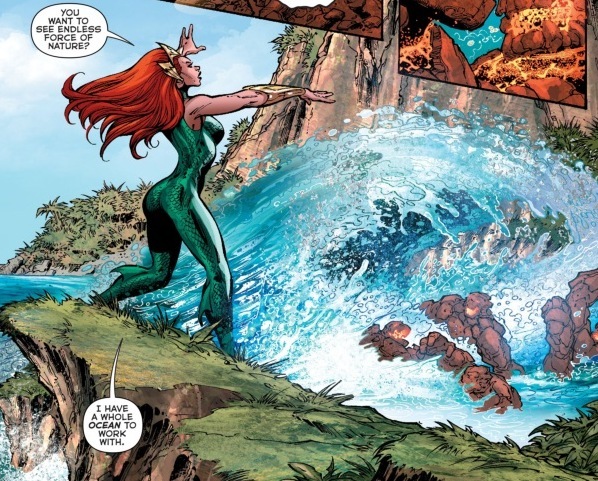 I seem to find myself every week trailing back to Mera and her hilarious one liners. I was glad to see the couple get a little one on one time in the issue as they seemed to be able to open up more not only as superheros but as characters in general. I am also a huge fan of the costumes in this series and I think that they have been given the utmost care especially when it comes to Atlanna. 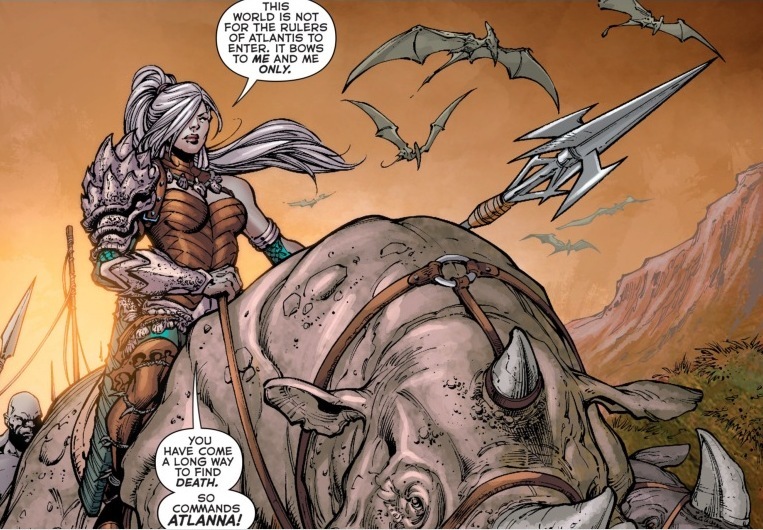 I think the tease of her is enough to draw people back into this series and restart a whole new chapter of Aquaman. Oh my god definitely not enough AQUAMOM! After seeing the artwork a few months ago I was on edge waiting for her dramatic appearance only to have the cliff-hanger leave me with one measly little panel! That’s not enough of her for someone who has been waiting more than a month to see this wicked woman in action. I’m praying she really gives the two love birds a good run for their money and isn’t the queen they think she will be. 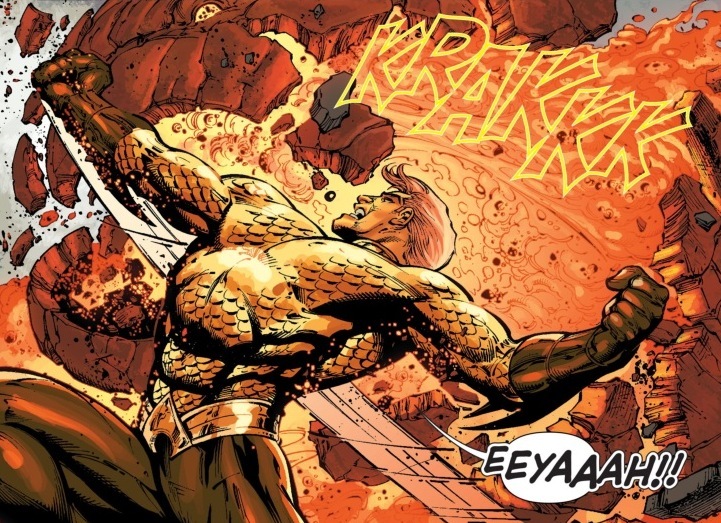 Aquaman and Mera now find themselves in unfamiliar waters staring down a foe that doesn’t seem to fit the perceived expectations. 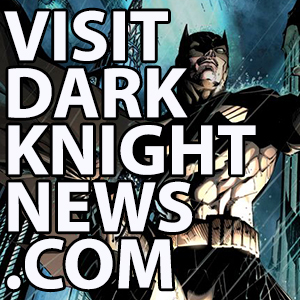 Will Aquaman be able to reason with his long lost mother or will the tides turn red with disappointment?